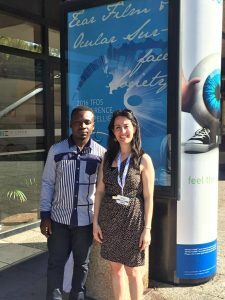 The 2016 Optical Foundation Frans Oosterhof Travel Grant was awarded to Acheampong Oppong, who attended the Tear Film and Ocular Surface Conference in Montpellier, France. Acheampong is a student at the Kwame Nkrumah University of Science and Technology. He will be graduating in summer 2017 and aspires to enter private optometric practice. “I believe being in a private practice will give me the independence to ensure that all my patients get the time and quality of care that they deserve at a price they can afford, which is mostly not the case in many health centers in my home country”, is what Acheampong wrote. Acheampong had a very positive and educative experience at the TFOS Conference – as outlined in his letter.